An upstanding feature, but not a building. Examples include crosses, gravestones, burial chambers, obelisks, signposts and postboxes. The Calderstones name refers these days to a group of six megaliths which stand in a greenhouse in Calderstones Park. These are the remains of a Neolithic burial chamber which once stood on the edge of the Harthill estate. The Harthill Estate later became Calderstones Park. 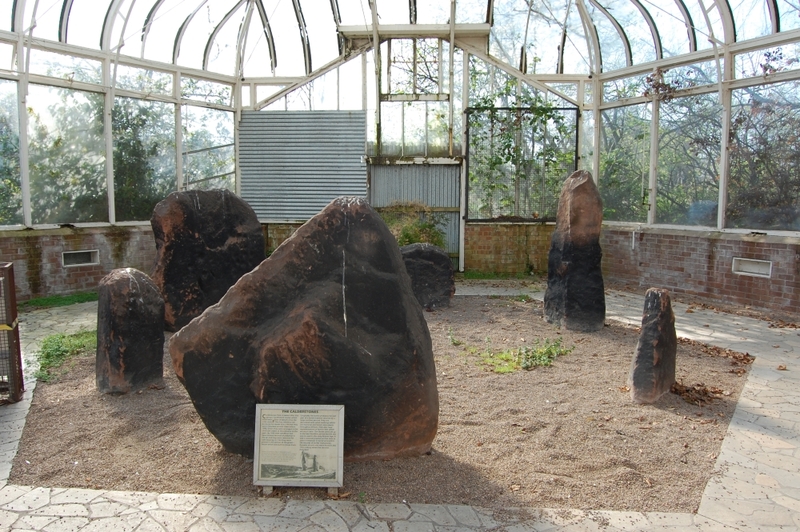 Before they were placed in the greenhouse in 1954, the stones stood in a circle at the entrance to the park. This was inside the roundabout on the junction between Druids Cross Road and Calderstones Road. Research by the Merseyside Archaeological Society suggests that the monument originally stood about 20 metres further west. The site is now occupied by modern flats. The monument would originally have seen the stones built up into a ‘box’ shape. That stone box would have had a turf and soil mound piled on top. In appearance it would have looked similar to the mound at Bryn Celli Ddu on Anglesey. That’s a passage tomb similar in size and date to the Calderstones. The demise of the Calderstones mound was probably due to the taking of sand, and perhaps stone. These are both materials which are valued for building. Paintings show that the stones were already exposed by the 1840s. However, another image from 1825 seems to show the very last remains of the mound still visible. It’s safe to say that no one really knows the full meaning or intention behind the building of the Calderstones passage tomb. However, a look at the stones can tell us a little about it, and allow comparisons with other, better-understood sites. The carvings on the stones are comparable with monuments all around the Irish Sea, from Scotland, Ireland and North Wales. Some say these stones are the most decorated of their kind, and one of the dagger shaped carvings even bears a resemblance to a tomb carving in Spain! The megalithic building traditions started in the Mediterranean area. Those traditions then made their way up the Atlantic seaboard, becoming heavily associated with north west Europe. Secondly, a look at the landscape in which the Calderstones sit yields further clues. The monument’s original site, like many similar tombs, is towards the top of sloping ground. The spot itself is just shy of the summit. 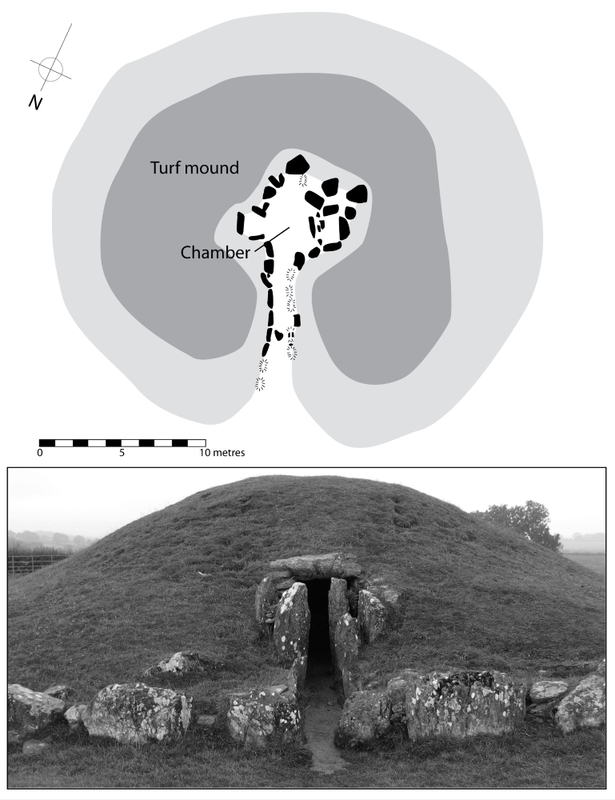 In the Neolithic period, the tomb may have been extremely easy to see from the well-used pathways of the valley floor. A map used in a boundary dispute in 1568 shows at least three other monuments in the area. Robin Hood’s Stone, which still exists, and the Rodger Stone, which does not, are standing stones. (The third monument, the Pikeloo Hill, also no longer exists). Examples in other parts of Europe suggest that standing stones were in valley bottoms, or on trackways. People could have used the stones as marker points. Perhaps people were expected to take a moment to gaze uphill to where the ancestors were buried. 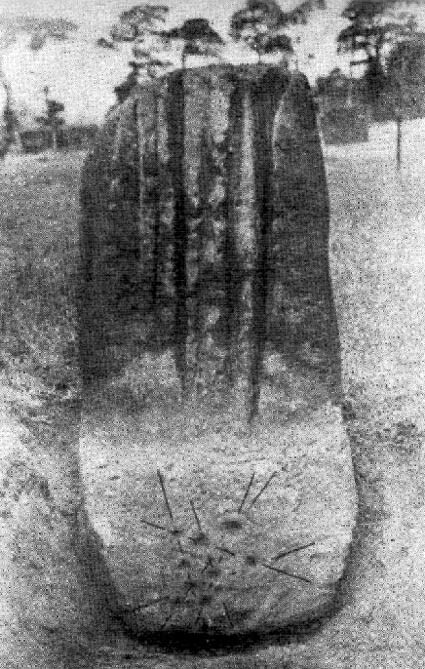 Liverpool’s two standing stones may have played this role in the Calderstones landscape. The Calderstones tomb was extremely long-lived, and may have been used for up to 800 years after it was raised. It may even be the case that this tomb was one of the last of its kind, still being visited as the Bronze Age began and new religious practices emerged. The stones have been sitting in a greenhouse for some decades now. It has done nothing to help preserve them. The sandstone from which they are made is prone to flaking in an environment like this. Temperature can change often and humidity is high. Projects to investigate the ancient history of the area have included the Calderstones in their plans. As this article was being written came news that the stones should be about to move to an open air site closer to their original location. The Reader Organisation, a reading charity which currently runs its operations from the Calderstones Mansion, intends this as part of a £2 million project to create an International Centre for Reading. The Calderstones of Liverpool, by John Reppion at the Daily Grail. As an archaeologist, I often bump into the border between the historical (especially the prehistorical) and the strange. By that I mean the paranormal, the unexplained or the mysterious. Ancient monuments like the Calderstones are rife with legend and half-known stories. I have to admit that I love all that stuff! But sometimes historical and archaeological knowledge is fascinatingly mysterious in its own right. For example, it has allowed John Reppion to write an incredibly comprehensive history of said Calderstones. 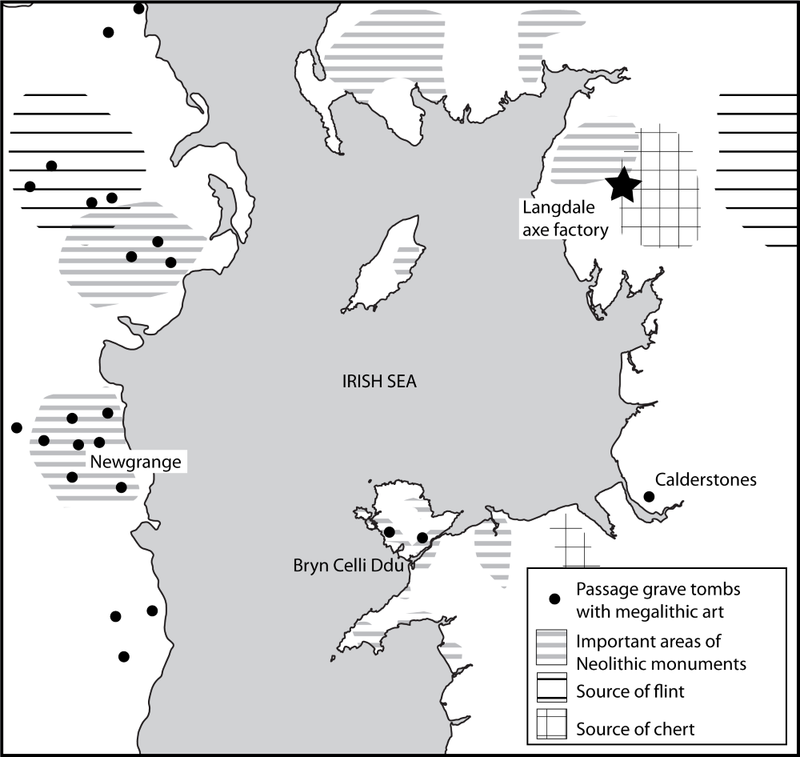 We also get details of associated monuments like Robin Hood’s Stone, also in Liverpool, and Barclodiad y Gawres and Bryn Celli Ddu in Anglesey, which share some important features with the Merseyside monument. Antiquarians linked them to Druids. They invented gory stories of blood running down the (in truth, natural) grooves on Robin Hood’s Stone. Finally, John considers what might happen to the Stones in the near future. There’s a possible move from their present site, which he calls a potential “mixed blessing”. It’s certainly true that the Reader Organisation, who will be carrying out the move, have their work cut out to find the right solution. Luckily, they’re taking the time they need. Robin Hood’s Stone (or the Robin Hood Stone) is a Neolithic or Bronze Age standing stone currently to be found within a set of railings on the corner of Booker Avenue and Archerfield Road. It originally stood to the north east in the middle of a field known as Stone Hey, but was moved when the nearby houses were built in 1928. Robin Hood’s Stone is a roughly rectangular stone around two metres high, just under a metre wide and half a metre thick. Deep grooves run down one of the larger faces, and these stop at what would have been the original ground level. Everything beyond the end of the grooves was buried when Robin Hood’s Stone was in Stone Hey. 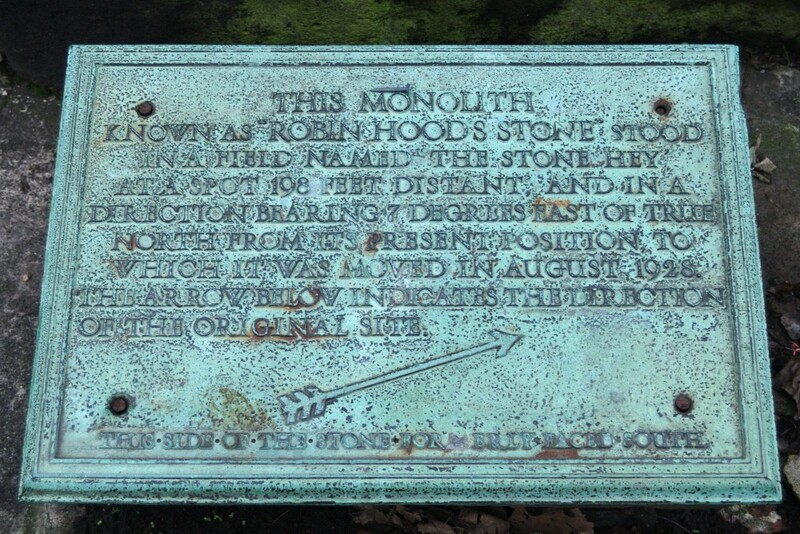 “This Monolith known as Robin Hood’s Stone, stood in a field named the Stone Hey at a spot 280 feet bearing North from its present position, to which it was moved in August 1928. The arrow below indicates the direction of the original site. This side of the stone formerly faced South”. Engraved at the base of the stone, as has been mentioned, are a collection of cup and ring marks. Marks like these, made of concentric carved rings with circular ‘cups’ at their centre, can be found across the west and north of Britain and in Ireland too. Robin Hood’s Stone originally stood to the north east of its current site, in a field known appropriately as Stone Hey. ‘Hey’ is a word of Anglo-Saxon origin, and suggests an enclosure, possibly for animals. It’s been suggested that a farmer brought the stone to this field to let the grazing animals scratch themselves on it. 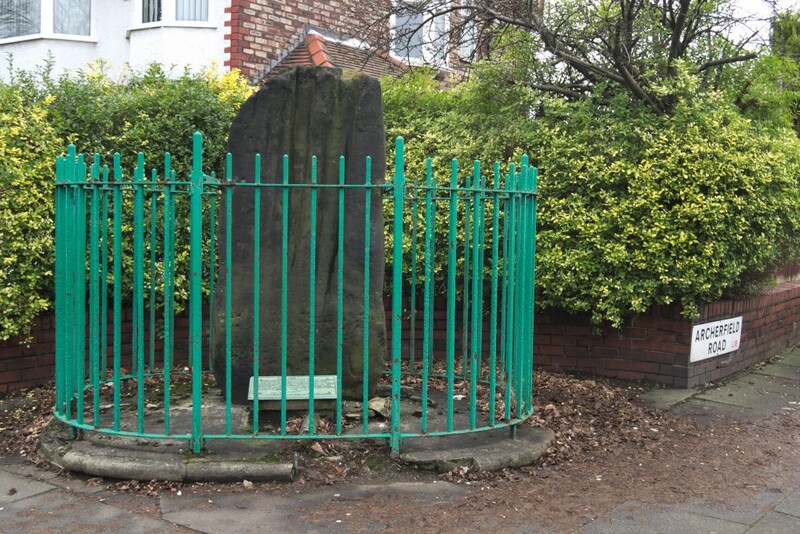 Although Robin Hood’s Stone may originally have been part of the Calderstones, we know that it has stood alone in this part of Liverpool since at least 1771, when Eye’s map of Liverpool shows the Stone Hey field name. So it’s sensible to suggest that, although the Stone itself is not marked on that map, it was in this field at that time. A boundary dispute of 1568, which uses a number of ancient monuments as boundary markers, mentions that a stone was removed from the mound of the Calderstones in around 1550. 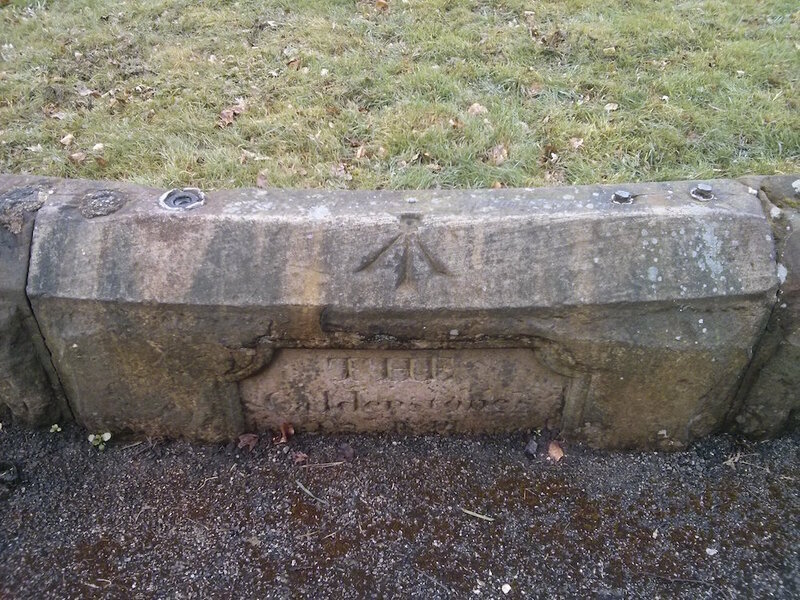 This may or may not have been Robin Hood’s Stone, but the cup and ring markings near the base of the pillar date the stone to a similar era to the Calderstones. So the movement of Robin Hood’s Stone could have taken it from the Calderstones mound itself, to Stone Hey (now the location of 11 Greenwood Road), and finally 280 feet south east to its present location on Booker Avenue in 1928. The very name of the stone is a reference, of course, to the famed archer of Sherwood Forest, and this comes from the long grooves in the rock. Legend has it that these grooves were made by medieval archers sharpening their arrow heads on the stone in the course of practising their aim. There’s no direct evidence for this, and the Robin Hood name is merely an extra layer in the mythology. Another more gruesome legend suggests that the grooves are there as drains for the blood of the Druids’ human sacrifices! Needless to say this is a typical over-excited Victorian story, and quite far from the truth. Prior to its relocation to Booker Avenue, the Stone was excavated on October 29th 1910, which was when the carvings were rediscovered. These have since been compared to the carvings on the Calderstones, dating Robin Hood’s Stone to a similar date, the Neolithic. In 1924 the Stone became a Scheduled Ancient Monument, but due to the threat posed by the new housing, it was relocated to its present site in August 1928 by the Liverpool Corporation and the Mersey Building Company. It was protected with the iron railings, and has stood in this state ever since. 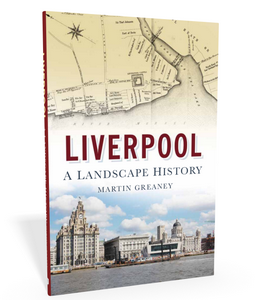 Liverpool has always been a trading port, and so it’s no surprise that features have come and gone in the landscape which sought to make this as easy and safe as possible. Everton Beacon was one such feature, and took advantage of the natural rise in the ground to the north of Liverpool’s centre. All the images we have of the Everton Beacon today are of a tower with two storeys (though some sources incorrectly state there to be three). It was built out of the classic Liverpool red-brown sandstone, probably from a source very close to the Beacon’s location. It was reported to be 25 feet tall and 6 feet square. There was an earth-floored kitchen in the lower storey, with a fireplace in one corner. On the first floor was a living space and above that, on the roof, a cement and stone firebox in which could be set a blaze to make Everton Beacon more visible to vessels on the River Mersey. This may be why rumours have grown up around the Beacon to suggest that it was built to warn England of the approach of the Spanish Armada in 1588. 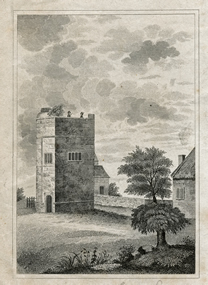 It’s been written that the Beacon was built in 1230 by Ranuf, Earl of Chester, but Robert Syers in his The history of Everton, including familiar dissertations on the people, and descriptive delineations of the several & separate properties of the township suggests that this is unlikely. Perhaps an earlier form of the Beacon was first erected then, replaced with the more recent version in later centuries. Part of the reason to doubt a great age was the poor quality of the construction. Syers calls it poorly built and of little architectural merit. Towards the end of the building’s life it was in a very poor state, with a crack running right down its south side, and the whole thing laying “open, unwatched and unguarded” (and therefore uncared for). Syers also tells us that marriages took place in Everton Beacon, the tower acting as a venue for those priests who were cast out of Liverpool during the Civil War for being on the wrong side. In Liverpool’s case the ‘wrong’ side was the King’s. This use of the tower puts its construction back at least to the 1640s or 1650s. Other residents included a watch movement maker shortly after 1770, and a cobbler around 1783. Whether either of these lived here ‘officially’ (e.g. paid rent) is not known. The picture we get from these possibly unofficial residents is one of abandonment, both of the building and possibly the poor souls who found refuge here. Syers also notes that it was most often frequented by ‘idlers and casual visitors’, who carved their names and initials into the soft stone walls. Apart from these occasional folk, the tower was open to the elements and the local cattle, who wandered in and out at will. Everton Beacon was poorly built, a useful pile of rock if nothing more. By the 18th Century it had dangerous cracks running down its walls and had been long neglected. One dark and stormy night in 1803, the flimsy structure was felled, perhaps by no more than a gust of wind, the last straw which broke its feeble back. 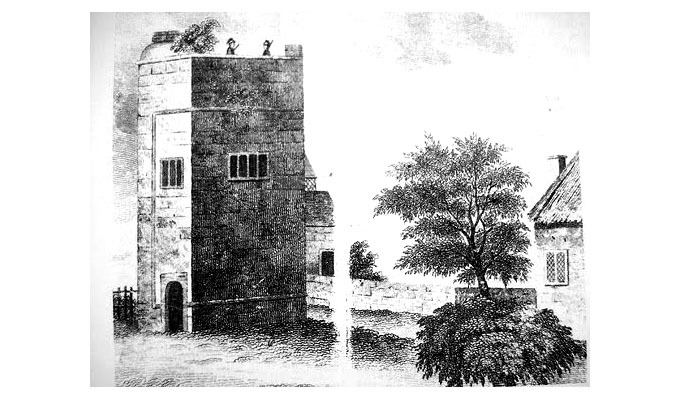 No obvious remains of the Beacon can be seen today, but its known that St. George’s Church in Everton was later built on or near the site, being the highest point of the hill. Recent map-based research by YO! Liverpool member ‘dazza’ suggests that in fact the site may be just to the south east of the church, raising the possibility that something of Everton Beacon’s foundations may be accessible to adventurous archaeologists. Syers, Robert, 1830, The history of Everton, including familiar dissertations on the people, and descriptive delineations of the several & separate properties of the township, G & J Robinson, Liverpool. The ancient village of Much Woolton is two miles and a half inland from the bank of the Mersey and six and a half miles in a south-easterly direction from Walton-on-the-Hill. The Knights of S. John of Jerusalem had a grange here. A wake was held on Woolton Green on Midsummer Day. Mr. Cox (Transactions, Historic Society of Lancashire and Cheshire, for 1895) describes the remains of the market cross as consisting of a short pyramidal chamfered shaft, socketted into an old base, which was carried on two steps. The site was the centre of the old village, where the district council offices now stand. The structure, I understand, was taken down about the year 1900, and given to Mr. Reynolds, who placed it in his garden. These words occur on the six-inch ordnance map at the intersection of roads one-third of a mile south-east from the centre of Gateacre village and about half a mile in a north-easterly direction from Much Woolton Church. The words “pedestal of stone cross” occur on the 1848 six-inch ordnance map at “Hunt’s Cross,” close to Hunt’s Cross Station, at the intersection of Hunt’s Cross Lane and Sandy Lane, two miles inland from the river Mersey. 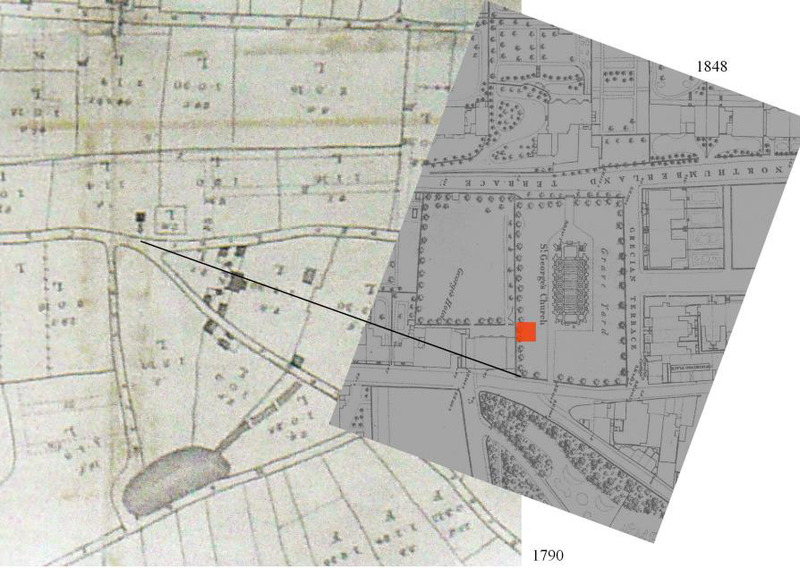 The words “Hunt’s Cross House” occur on the map close to the site of the cross. Mr. Cox writes, 1895, that the remains of this cross consist of a massive square stone socket lying by a barn at the cross-roads near the station. The words “Cross Hillocks” and “Cross Hillock’s Farm” occur at the meeting of roads three miles east from Much Woolton Church. An interesting history of Garston from the pen of Mr. E.W. Cox is printed in the Transactions of the Historic Society of Lancashire and Cheshire for 1888, with pictures of the village and crosses as they existed in the year 1850. At that date Garston was an old-fashioned fishing village near the Otter’s Pool, on the north bank of the Mersey, but of late years everythying has been changed by the formation of the docks and the advent of various manufacturing industries. A water-colour drawing in the Binns Collection shows this cross in an open space near a cottage. A church appears in the distance. The head of the cross is gone, but a portion of the square shaft is shown socketted in the customary way into a pedestal, carried on a calvary or flight of three steps. The remains are almost exactly a fac-simile of what may now be seen any day at Cronton. 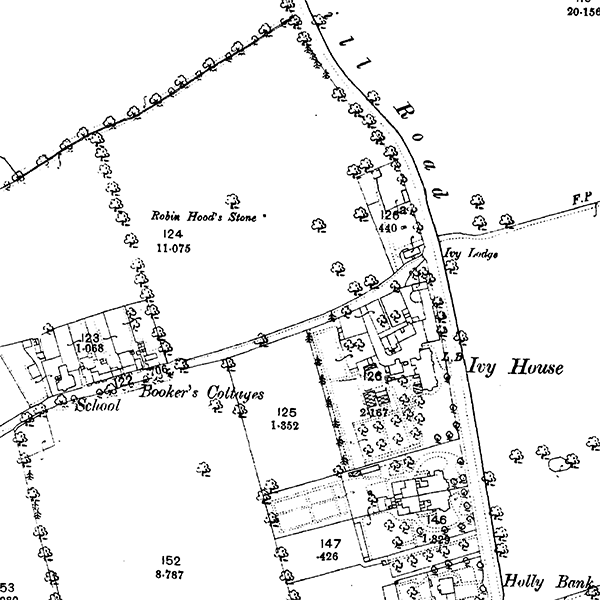 In Syer’s History of Everton, published in 1830, a plan of the village is given, taken from an old deed, showing the “Headless Cross” on the common, near the beacon. Mr. Cox writes: “The remains of the cross which stood in the centre of the village were put into the Roundhouse when taken down. It was a market cross.” The site of the cross was one and a half miles south of Walton-on-the-Hill, and the same distance inland from the river bank. The word “cross” in Gothic letters appears on the 1848 map one and a half miles east of Wavertree. Mr. Cox thus describes it in the Transactions of the Historic Society of Lancashire and Cheshire (volume for 1895): “On the roadside, near Well Lane, stood the slender octagonal shaft of a cross, on an octagon socket and three steps. It was a wayside cross, probably marking the lands of the monks of Stanlaw and Whalley, who had a cell there. The stones were thrown over into the field when the road was widened, and were thence carted away.” The church is of ancient foundation, and is mentioned in the Domesday Survey. Mr. W. Bowdon, of Gorsefield, Patricroft, writes June 24th, 1901: “I was at Childwall on Friday, and looked up what remains of the cross there. Two steps, base about twenty-seven inches, with a socket of about twelve inches, shaft and arms gone.” Mr. Harrison, in his Liverpool District Place-Names, tells us that the modern English equivalent of Childwall is Wellfield or Springfield. We have thus another instance of a well and a cross together. Mr. Hope writes in his Legendary Lore of the Holy Wells of England: “There is a well here which has the reputation of being haunted, a fratricide having been committed there. It was a haunt of pick-pockets and other disorderly characters. It is now built over, and in a few short years the subterranean passage leading to the well will be forgotten.” The following extracts from the Crosse Deeds related to this town:- 1412. Quitclaim from Nicholas de Lyverpull, clerk, to John le Dey, of Lyverpull, his heirs and assigns, of one land of ground, lying between the Crosses next the Shootsacres, which Gilbert de Everton holds by the devise of Latilda de Sefton and the above Nicholas. Witnesses:- Robert de Derby, then Mayor of Lyverpull, Thomas de Bold and Roger de Holland, then Bailiffs of Lyverpull, Hugh de Botyll, Thomas de Gleest, and others. Given at Lyverpuul, in the third week of Lent [4-10 March] 14 Henry IV. . Grant from John Wodes and Alice his wife of Lyverpull, to John Crosse, of one selion of land, called le Dobul lond lying between the Crosses, in the field of Lyverpull, viz., two hallands lying upon the roadleading to the Breke and one halland on the same road, between the selion late of Derby on the north and land of the late John More on the south. Witnesses:- Hugh Harebron . . . Given at Lyverpull on the 20th day of May 12 Edward IV. . Grant from Richard Crosse, son and heir of John Crosse of Lyverpull, to WIlliam Crosse his brother and son of the said John of one tenement with houses and gardens, in le Dale strete Lyverpull, in the tenure of Henry Plombe, and of two buildings with chambers next the Cross in the same town. Witnesses, James Molyneux rector of Sefton . . . Given at Lyverpull on 10th September 18 Henry VII. .
Allerton is distant about three-quarters of a mile in a south-westerly direction from Much Woolton. So far, I have been unable to discover any traces of the well, but the words “Spring Wood” occur on the map close to Allerton Hall. Skeat describes the word Twiss as used of the place where two streams meet. In the Binns Collection, vol. ii., p. 26, an illustration is given of this structure, consisting of a classical pillar carried on three steps. Adjoining it are the stocks, so arranged that the culprits sit on the bottom step. The pillar may have carried a sun-dial, replacing the ancient cross. The drawing is dated 1818. The structure is shown in an open space opposite a half-timbered building. Considerable doubt exists as to the history of this structure. Three views of it are given in the Binns Collection in the Liverpool Free Library; two of them are practically identical, showing an Early Gothic arched recess in a wall, below which is a well square in shape surrounded by masonry. Above the arch are indications of an inscription. A later engraving shows the arch surmounted by a cross bearing the inscription, “Deus dedit homo bibit.” A recent photograph appears to indicate that the whole structure has been rebuilt since the date of the last engraving, with sundry variations from the original design, which shows an ancient structure in ruins. Mr. Cox (Historic Society of Lancashire and Cheshire for 1895) writes: “An old man remembered this well open, and told me that the descent to it was by several steps. The source of the water is not at the well, but under the lawn of ‘Monkswell,’ and a passage led to it. The inscription formerly over it is well known – ‘Qui non dat quod habet, Daemon infra videt. Anno 1414. '” In the rebuilt structure this inscription appears to have been inaccurately copied. I have not as yet come upon any documentary evidence to prove whether or not the structure represented by the Binns engravings is of really ancient date. The pedestal of this cross was dug up by the gravedigger a few years ago and has been left above ground in the churchyard. It is of rough stone and much time-worn. The stone measures five feet square at the base, is two feet thick, and the socket for the missing cross is eighteen inches by fifteen inches and fourteen inches deep. The cross was, therefore, a large and probably lofty one. The majority of the shafts in Lancashire were much smaller than this. In pre-Normal crosses the calvary, or flight of three steps, were often worked, as in this case, one one stone, and this fact leads to the conclusion that the cross was of pre-Normal date. A notable example is to be seen in Halton Churchyard, near Lancaster. In the church is preserved a portion of the circular head of a cross with cable moulding, likewise dug up in the churchyard, which may have formed part of this early cross. The church is of pre-Norman foundation and is named in Domesday. The sculptures on the font were clearly chiselled before the date of that survey. The parish was a large one and was indeed the mother church of the district. The site is opposite the mouth of the Mersey, about one and a half miles inland. These words occur on the 1848 six-inch ordnance map close to some old cottages, about one hundred yards to the north of the church. They have recently been pulled down. The well, when I saw it (in April, 1900), was a walled-in dipping well, on the east side of the lane, running due north from Huyton village. It does not appear to be known why the well has its present designation, but Baines states that two chantries were founded here, the first by John de Winwick, rector of Wigan, in 1350 (dedicated to the Virgin); the other by his brother, Richard de Winwick, rector of Walton-on-the-Hill (dedicated to S. Michael the Archangel). Possibly, chantry priests lived in the cottages.